Road transport contributes significantly to urban air pollution in many countries. Mobile sources produce several important air pollutants, such as air toxics and greenhouse gases. The most widely used models for the atmospheric emission inventories and scenarios are based on the emission factor approach: for road traffic an emission factor (EF) represents the relationship between the amount of pollution produced and the number of vehicle-kilometer traveled. 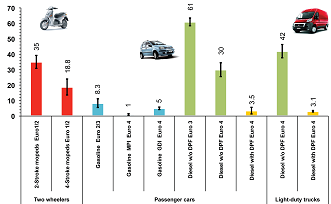 The assessment of vehicular emission factors includes laboratory studies using chassis dynamometers and emission benches or portable measurement systems (PEMS) with a direct on-board sampling during the real use of vehicle on-road. Istituto Motori realizes test campaigns (in laboratory and on-road) measuring emissions and fuel economy from different kind of vehicles (cars, buses, light and heavy-duty trucks, mopeds and motorcycles) to evaluate the effect of driving behaviour, road type, load, traffic conditions, engine technology, fuel quality, emission control equipment etc..
Istituto Motori has extensive experience in monitoring micropollutants, such as Polycyclic Aromatic Hydrocarbons (PAH), benzene and Volatile Organic Componds (VOC), particulate matter (PM) and its size fractions. The fine-particulate fraction (PM2.5) represents a particular health concern because these can penetrate the respiratory system deeply and be absorbed into the bloodstream. Road traffic is an important source of particulate matter, though the proportions vary during the year and from place to place. Diesel vehicles without Diesel Particulate Filter (DPF) and mopeds present the highest particle mass (PM) and number (PN) emissions and, among mopeds, 2-stroke are more emissive than 4-stroke. The introduction of DPF at diesel exhaust reduces particle emissions by almost two orders of magnitude. Istituto Motori activity also covers the development and experimental validation of emission factor modelling. A meso-scale emission model, named KEM, Kinematic Emission Model, has been developed; it is located at an intermediate level between models for national or regional inventories and the instantaneous models. The specificity and innovation of this model is in the detailed description of the velocity profile obtained using a multidimensional statistical approach, from an extremely large number of variables that characterize all phases of the vehicle kinematics, much deeper respect to the use as input variable of the mean velocity only.In the frame of the interaction between the combustion process products and the environment further studies are performed aimed to the remote optical multispecies monitoring of emissions and tropospheric pollutants.